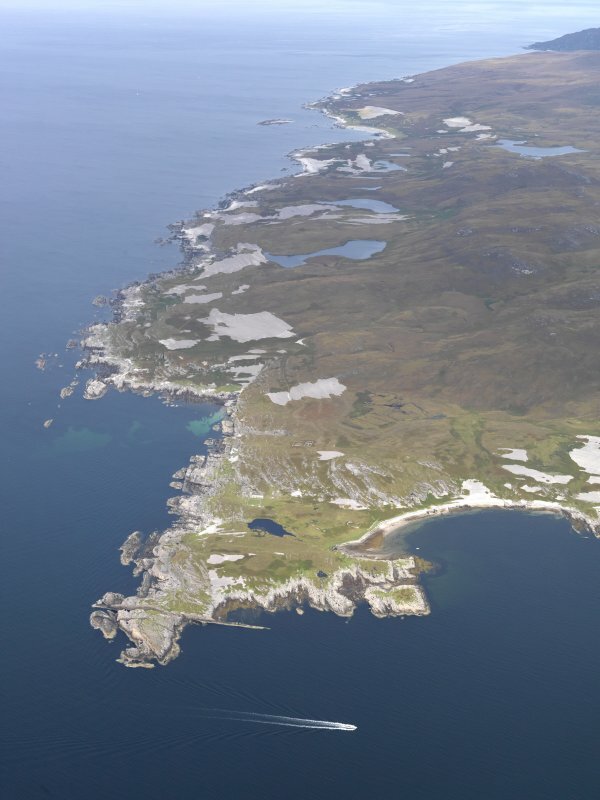 General oblique aerial view of Rubh'an t-Sailean and the NW coast of Jura, taken from the SW. This name, meaning "The Palace", applies to the remains of an old castle at Glengarrisdale. The name "Aros" means "a dwelling". At the site of An Aros, are faint indications of two small enclosures of irregular shape perhaps about 30ft across, but no details can be made out with certainty. Ever since 1330, the N end of Jura has been owned by the Macleans, with a stronghold, Aros Castle, at Glengarrisdale. This has all but disappeared, its stone probably used to make the existing buildings. According to J Mercer (Lealt, Jura), the turf-covered footings of the building situated at NR 6440 9692, on a low, rocky summit immediately to the west of the house of Glengarrisdale, are the remains of An Aros. It measures internally about 11.0m NW-SE by 4.0m wide at the N end, jutting to 5.0m wide in the south; the wall is 0.5m maximum height and 1.1m wide. The interior is sub-divided into three compartments. The remains do not appear to have the strength of a purpose-built castle, though the walls are slightly wider than those of the usual deserted farmhouse. No other structures resembling a castle can be identified in the area. Visited by OS (NKB), 7 May 1978. There are no identifiable remains of the supposed castle of the MacLeans of Lochbuie that is said to have stood here. between the MacLeans and the Campbells in 1647. RCAHMS 1984, visited August 1973.